Aim: To assess and compare the incidence and intensity of experienced after an in-office vital tooth bleaching in case of dental fluorosis using two different types of desensitizing agents, at different time periods. 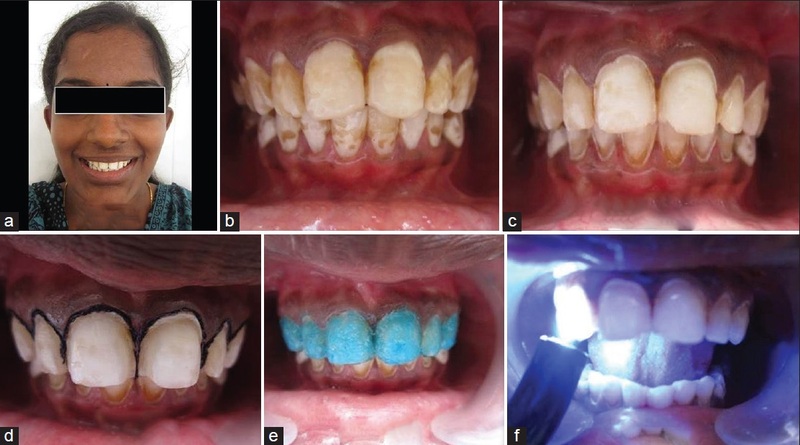 Materials and Methods: Sixty-nine subjects with mild-to-moderate fluorosis were randomly divided into three groups of 23 each. Group I - control group (placebo), group II-potassium nitrate 5% and sodium monofluorophosphate 0.7% (Sensodent KF), and group III-Casein Phosphopeptide-Amorphous Calcium Phosphate (CPP-ACP) (Tooth Mousse). In-office vital tooth bleaching was done using 35% hydrogen peroxide liquid (Pola office) in two sessions. Desensitizing agent was applied for 10 min after each session. Postoperative sensitivity was recorded after 24 h and 7 days. The statistical analysis was done using chi-square test, analysis of variance (ANOVA), and post hoc Tukey's test. Results: The experimental groups showed significantly less incidence and intensity of sensitivity compared to control group, whereas there was no difference between them. Conclusion: The desensitizing agents used in the study show effective reduction after an in-office vital tooth bleaching. Aims: To compare the surface microhardness, setting time, and elemental and topographic changes of mineral trioxide aggregate (MTA) and calcium-enriched mixture (CEM) in contact with acidic, neutral, and alkaline solutions. Subjects and Methods: For evaluating 24-h and 28-day surface microhardness using Vickers test and initial setting time using Gillmore apparatus, glass molds were filled manually or ultrasonically, either with CEM or MTA and randomly immersed in solutions with acidic, neutral, and alkaline pH (5.4, 7.4, and 9.4, respectively). Topographic changes of the samples as well as energy dispersive X-ray spectra were examined using the scanning electron microscopy. Statistical Analysis Used: Data were analyzed using the Kruskal-Wallis, Mann-Whitney, Wilcoxon, one- and two-way ANOVA, Tukey's post hoc, and t-tests. Results: After 28 days, there was an increase in the microhardness for all samples (without statistical significance [P > 0.05]), except for the samples of CEM in acidic environment (P > 0.05). The setting time of MTA samples was statistically higher than CEM samples ( P ≤ 0.001). The setting time of both biomaterials was significantly higher in acidic pH than other groups (P ≤ 0.005). Surface topography and elemental constituents of biomaterials were altered in different solutions. Conclusion: The surface microhardness, setting time, and elemental and topographic properties of MTA and CEM were affected by different solutions. CEM exhibited quicker setting time than MTA; however, acidic solution negatively influenced both of them. Background: An ideal root canal obturation requires a complete dentinal wall adaptation of sealer and Gutta-percha combinations without any gap formations. Aims: The aim of the study was to evaluate the dentinal wall adaptation ability of MTA Fillapex root canal sealer using stereo electron microscope (SEM). Methods: Twenty-four, single-rooted, human maxillary incisor teeth were used. All canals were prepared with a rotary nickel-titanium (Ni-Ti) instrument to a size F3 file. Teeth divided into two equal groups and one of the experimental groups was filled with AH Plus, and the other group was filled with MTA Fillapex using Gutta-percha single cone as a core material. The roots were prepared for SEM evaluation, and serial scanning electron photomicrographs were taken at ×50, ×100, ×500, and ×1000 magnifications. The gaps between the root canal sealer and canal walls were detected and measured in coronal, middle, and apical thirds. For each section, the highest value among the detected gap formations was recorded. 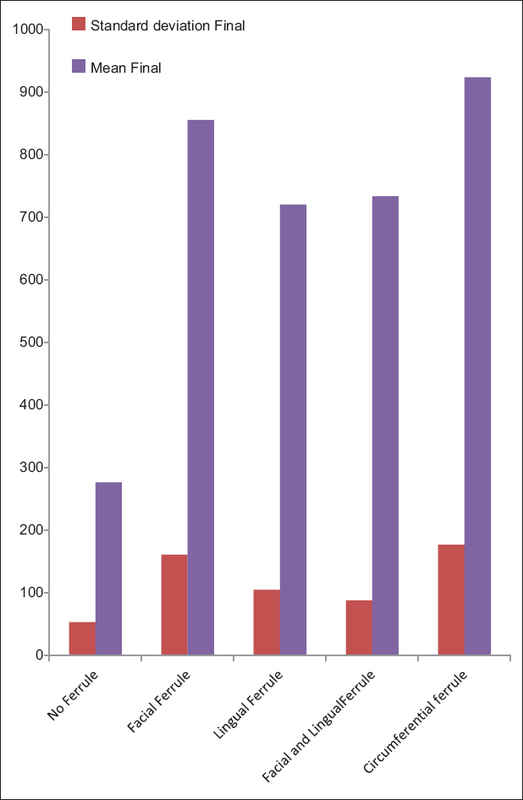 Statistical Analysis: Mann-Whitney U-test, Freidman, and Wilcoxon tests were used. Results: The statistical analysis showed no significant difference between two sealers in terms of gap formation (P > 0.05). Conclusions: MTA Fillapex has a similar dentinal wall adaptation ability as AH Plus does. Aims: The purpose of this study was to evaluate the resistance to torsional failure and cyclic fatigue resistance of ProTaper Next (PTN), WaveOne, and Mtwo files in continuous and reciprocating motion. Settings and Design: Randomized control trial in a tertiary care setting. Subjects and Methods: A total of 10 new size 25.06 taper PTN X2, 25.06 taper Mtwo files, and 25.08 taper WaveOne primary files each was selected. A custom fabricated cyclic fatigue testing device with a 70° angle of curvature and 3 mm width; curvature starting at 6 mm from the tip was used. All instruments were rotated and reciprocated till fracture occurred and time till fracture of each instrument was recorded in seconds. For torsional failure testing 5 mm tip of each file was embedded in composite resin block and uniform torsional stresses (300 rpm, 2.0 Ncm) were applied repetitively by an endodontic motor with auto stop mode until file succumbed to torsional failure. Number of load applications leading to failure was recorded. Statistical Analysis Used: Data were analyzed using t-test for equality of means, Pearson correlation, and ANOVA test. Results: All the files showed superior resistance to cyclic fatigue in reciprocating motion when compared with continuous rotation mode. WaveOne primary files displayed maximum resistance to cyclic fatigue both in continuous and reciprocating motion. WaveOne primary files also demonstrated maximum resistance to torsional failure followed by PTN with Mtwo files exhibiting least resistance. Conclusions: Operating files in reciprocating motion enhances their cyclic fatigue resistance. WaveOne files showed maximum resistance to cyclic fatigue and torsional failure due to their cross-sectional diameter coupled M-Wire technology. Aim: The purpose of the study was to evaluate and compare the sealing ability of mineral trioxide aggregate (MTA) with three different methods. Materials and Methods: Forty single canal teeth were decoronated, and root canals were enlarged to simulate immature apex. The samples were randomly divided into Group M D = MTA-angelus mixed with distilled water and Group M C = MTA-angelus mixed with 2% chlorhexidine, and apical seal was recorded with glucose penetration method, fluid filtration method, and dye penetration methods and compared. Results: The three methods of evaluation resulted differently. The glucose penetration method showed that M D sealed better than M C , but difference was statistically insignificant (P > 0.05). The fluid filtration method resulted that Group M C was statistically insignificant superior to Group M D (P > 0.05). The dye penetration method showed that Group M C sealed statistically better than Group M D . Conclusion: No correlation was found among the results obtained with the three methods of evaluation. Addition of chlorhexidine enhanced the sealing ability of MTA according to the fluid filtration test and dye leakage while according to the glucose penetration test, chlorhexidine did not enhance the sealing ability of MTA. This study showed that relying on the results of apical sealing by only method can be misleading. Background: Complete cleaning of the root canal is the goal for ensuring success in endodontics. Removal of debris plays an important role in achieving this goal. In spite of advancements in instrument design, apical extrusion of debris remains a source of inflammation in the periradicular region. Aim: To comparatively evaluate the amount of apically extruded debris with V-Taper, ProTaper Next, and the self-adjusting File (SAF) system. Materials and Methods: Sixty-four extracted human mandibular teeth with straight root canals were taken. Access openings were done and working length determined. The samples were randomly divided into three groups: Group I - V-Taper files (n = 20), Group II - ProTaper Next (n = 20), Group III - SAF (n = 20). Biomechanical preparation was completed and the debris collected in vials to be quantitatively determined. The data obtained was statistically analyzed using ANOVA and post hoc Tukey's test. Results: All the specimens showed apical debris extrusion. SAF showed significantly less debris extrusion compared to V-Taper and ProTaper Next (P < 0.001). Among Groups I and II, ProTaper Next showed lesser debris extrusion as compared to V-Taper, but it was not significant (P = 0.124). Conclusion: The SAF showed least amount of apical debris extrusion when compared to newer rotary endodontic instruments. This indicates that the incidence of inter-treatment flare-ups due to debris extrusion would be less with the SAF. 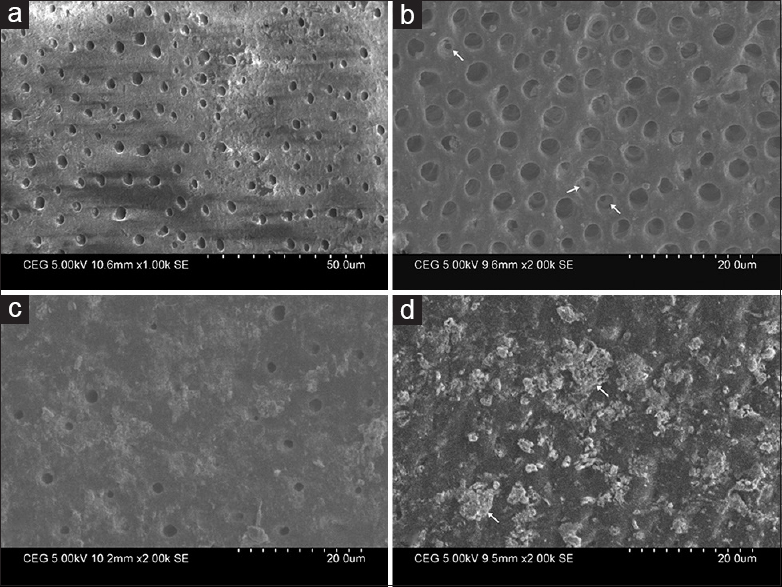 Aim: This in vitro study evaluated the degree of dentinal tubule occlusion and depth of penetration of nano-hydroxyapatite (nHAp) derived from chicken eggshell powder with and without the addition of 2% sodium fluoride (NaF) using scanning electron microscope (SEM) and confocal laser scanning microscope (CLSM). Materials and Methods: nHAp was synthesized and characterized using X-ray diffraction and SEM-energy dispersive spectroscopy. Dentin discs were obtained from extracted teeth, pretreated with 17% ethylenediaminetetraacetic acid for 5 min and were divided into four groups based on the experimental agents as follows: Group 1: Untreated (control), Group 2: 2% NaF, Group 3: nHAp, Group 4: Combination of nHAp and 2% NaF. The treatment protocol was carried out for 7 days, after which the specimens were viewed under SEM and CLSM. Statistical Analysis Used: One-way ANOVA and Tukey's post hoc multiple comparison tests (P < 0.05). Results: All the experimental agents occluded the dentinal tubules, but to varying degrees and depths. Specimens treated with the combination of nHAp and 2% NaF showed complete dentinal tubular occlusion and significantly greater depth of penetration than those treated with nHAp and 2% NaF alone. Conclusion: The combination of nHAp and 2% NaF was the most effective in occluding dentinal tubules. Background: Postoperative inflammation and endodontic failure occur due to apical extrusion of debris. Aim: To evaluate the amount of apically extruded debris after preparation of straight root canals in extracted human teeth using three rotary systems. Materials and Methods: Sixty single-rooted human teeth with single root canal and apical foramen were selected and randomly divided into three experimental groups (n = 20) according to the rotary system used: Group 1 - ProTaper, Group 2 - Revo-S, Group 3 - WaveOne. Apical enlargement was done up to size 40/0.06 for Groups 1 and 2 and 40/0.08 for Group 3. For debris collection, each tooth was held in a preweighed Eppendorf tube fixed inside a glass vial through rubber plug. After instrumentation, each tooth was separated from the Eppendorf tube and the debris adhering to the root surface was collected by washing the root with 1 mL of bi-distilled water and incubated at 70°C for 5 days. The dry weight of extruded debris was weighed in an electronic balance. Statistical Analysis: The mean weights of extruded debris were statistically analyzed using GraphPad prism version 6 and the intergroup comparison was done using unpaired t-test. Results: There was a statistically significant difference in the mean debris score among all the three groups - ProTaper (0.00065 g), Revo-S (0.00045 g) and WaveOne (0.00089 g). Conclusion: Revo-S system was associated with significantly less debris extrusion compared with ProTaper or WaveOne. Background: Over a period of the past few years' episodes of dental trauma more commonly coronal fractures of anterior teeth are being increasingly reported in children. Fragment reattachment can be considered as a valid treatment option in such situations. However, ideal medium for storage of fragments before reattachment needs to be explored. Aim: To compare the fracture resistance of incisor tooth fragments stored in four storage media: Dry air, milk, coconut water, or egg white before reattaching them with G-aenial Universal Flo. Materials and Methods: Forty-eight freshly extracted maxillary incisors were divided into four groups. Teeth were then sectioned, and fragments were stored in dry air (Group I), milk (Group II), coconut water (Group III), and egg white (Group IV). The fragments were reattached using simple reattachment technique and tested on the Universal Testing Machine. Statistical analysis was performed using one-way analysis of variance and post hoc Tukey's test. Results: There was statistically significant difference (P < 0.05) in fracture resistance values between the groups. 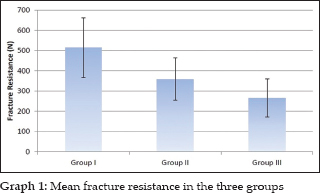 The highest fracture resistance value was demonstrated by Group II, whereas least fracture resistance values were observed in Group IV. Conclusion: Along with milk, coconut water being tested for the first time can be considered a viable alternative. 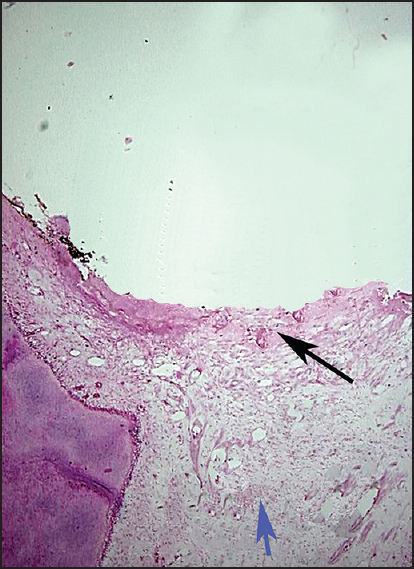 Context: Mineral trioxide aggregate (MTA) is a biocompatible repair material that is often used along with glass ionomer cement (GIC) in many clinical situations. Aims: In this study, the interface of GIC and MTA was examined, and the effect of time on this interface was tested. Settings and Design: Materials tested were set and plastic moulds and analysed. Materials and Methods: Forty 9-mm hollow cylindrical glass molds were filled with MTA and then according to the group either conventional GIC or resin-modified GIC (RMGIC) is filled immediately or after 45 min. The specimens were then sectioned, carbon coated, and examined using a scanning electron microscope (SEM) and the elemental analysis was done. Statistical Analysis: Observational study, no statistical analysis done. 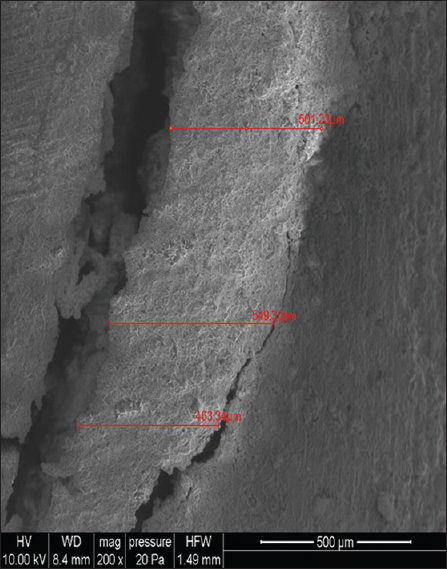 Results: The SEM showed that both the groups underwent adhesive separation and gap formation at the interface. The specimens in which GIC was condensed over freshly mixed MTA (group IIA and group IIB) also showed cohesive separation in MTA; however, it was more in the GIC condensed after 45 min over MTA groups (group IA and group IB). The results were better for conventional GIC than RMGIC. Conclusions: GIC can be applied over freshly mixed MTA with minimal effects on the MTA, but this effect decreases with time. Introduction: The aim of this in vitro study is to evaluate the role of light and laser sources in the bleaching ability of 37.5% H 2 O 2 on extracted human teeth. Materials and Methods: About 30 caries-free single-rooted maxillary central incisors were used for the study. Specimens were prepared by sectioning the crown portion of teeth mesiodistally, and labial surface was used for the study. Specimens were then immersed in coffee solution for staining. Color of each tooth was analyzed using Shadestar, a digital shademeter. Specimens were then divided into three groups of 10 each and were subjected to bleaching with 37.5% H 2 O 2 , 37.5% H 2 O 2 + light activation, and 37.5% H 2 O 2 + laser activation, respectively. Postbleaching, the color was analyzed for all the specimens immediately and then after 1, 2, and 3 weeks intervals, respectively. Results: All the statistical analyses were done using SPSS version 17. Intra- and inter-group comparisons were done with Friedman test and Kruskal-Wallis ANOVA, respectively. Statistical analysis concluded with a significant improvement in their shade values from baseline in all the three groups. Halogen light activation and laser-activated groups showed comparatively enhanced bleaching results over no-activation group, though the difference was not statistically significant. Conclusion: The results of the present study show that bleaching assisted with halogen light and laser showed increased lightness than nonlight activated group. Durability of bleaching results obtained postbleaching was maintained throughout the experimental trail period of 3 weeks for both halogen light and laser activation group, whereas no-light activation group presented with shade rebound after 2 weeks postbleaching. Introduction: In cases of severe hard tissue loss, 2 mm circumferential ferrule is difficult to achieve which leads to incorporation of different ferrule designs. Aim: To compare and evaluate the effect of different crown ferrule designs on the fracture resistance of mandibular premolars restored with fiber posts, composite cores, and crowns. Materials and Methods: Fifty freshly extracted mandibular premolars were endodontically treated and divided into five groups: Group I - 2 mm circumferential ferrule above the cementoenamel junction (CEJ); Group II - 2 mm ferrule on the facial aspect above CEJ; Group III - 2 mm ferrule on the lingual aspect above CEJ; Group IV - 2 mm ferrule on the facial and lingual aspects above CEJ with interproximal concavities, and Group V - no ferrule (control group) and were later restored with fiber posts, composite cores, and crowns. Specimens were mounted on a universal testing machine, and compressive load was applied at a crosshead speed of 1 mm/min until fracture occurred. Results: The results showed that circumferential ferrule produced the highest mean fracture resistance and the least fracture resistance was found in the control group. Conclusion: Circumferential ferrule increases the fracture resistance of endodontically treated teeth restored with bonded post, core, and crown. Aims: The aim of this study is to compare in vitro the fracture resistance of the endodontically treated tooth restored with a novel design Sharonlay, with the two component restorative method, i.e., post with separate onlay, and onlay without post. Subjects and Methods: 45 single-rooted mandibular second premolars were taken, and root canal treatment was performed. Teeth were then randomly divided into three groups (n = 15) based on the type of restoration given: Group I - metal onlay with cast post extension (Sharonlay), Group II - metal onlay with prefabricated metal post (Mani post system), Group III - metal onlay over endodontically treated tooth obturated with Gutta-percha (control group). Fracture resistance was checked using the Instron universal testing machine and the fracture patterns were analyzed. Results: According to the values recorded, Group I showed maximum mean fracture resistance followed by Groups II and III. Statistically significant difference was found between Groups I and II and Groups I and III and statistically significant difference was found between Groups II and III. Conclusion: A single unit component Sharonlay, gives higher fracture resistance to a premolar as compared to (a) metal onlay with prefabricated metal post and (b) metal onlay over endodontically treated tooth. 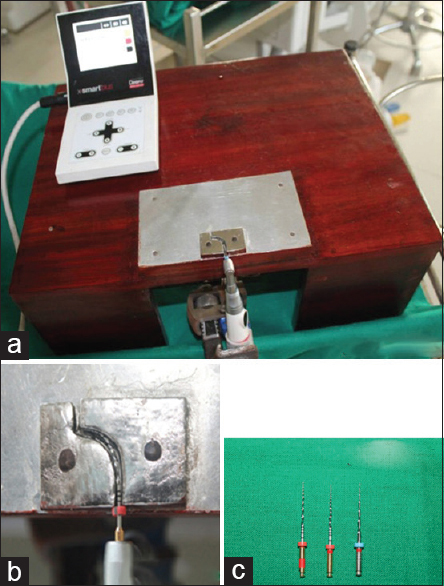 Aim: To compare human pulp tissue response following direct pulp capping with calcium hydroxide and a self-etch adhesive containing antibacterial component. Materials and Methods: Sixty-six erupted sound premolars scheduled to be extracted for orthodontic reasons were selected from 17 human subjects. Pulp exposures were made. Direct pulp capping was then performed using calcium hydroxide and a self-etch adhesive containing antibacterial component in its primer. The teeth were then restored with composite resin. Two teeth were maintained intact as a control group. After 7 and 30 days, teeth were extracted and processed for light microscopic examination using a histological scoring system. The teeth were divided into four groups (N = 16) according to the pulp capping materials used and their days of extraction. The results were then statistically analyzed by Mann-Whitney U-test. 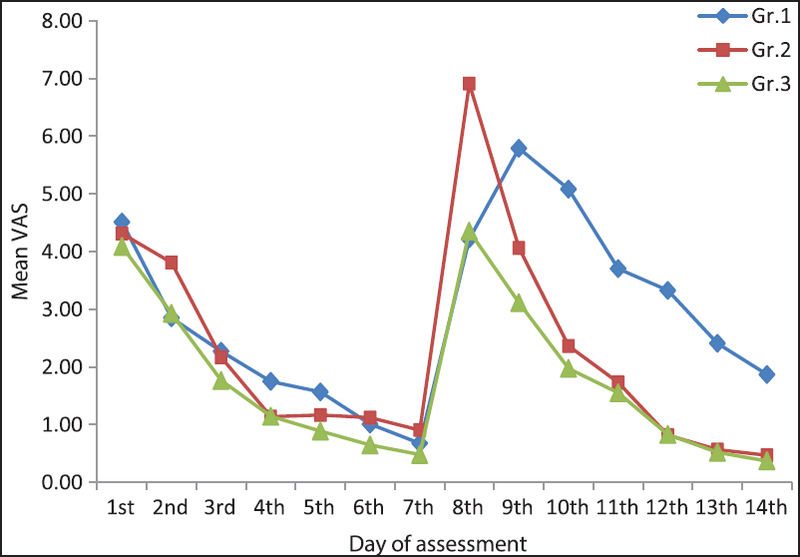 Results: After the 7-day observation period, the inflammatory reaction to the self-etch adhesive containing antibacterial component group was significantly less severe than that in the calcium hydroxide group (P < 0.05). After the 30-day observation period, the inflammatory reaction was slight in both groups, but specimens with dentin bridge formation in the self-etch adhesive group were significantly less common than those in the calcium hydroxide group (P < 0.05). The failure of amalgam retrofilling and presence of an associated cystic lesion makes surgical endodontic intervention inevitable. Amalgam retrofilling can also give rise to mucoperiosteal tattoo formation and allow incorporation of amalgam particles in the cystic lining. Such a finding has not yet been reported in the endodontic literature. 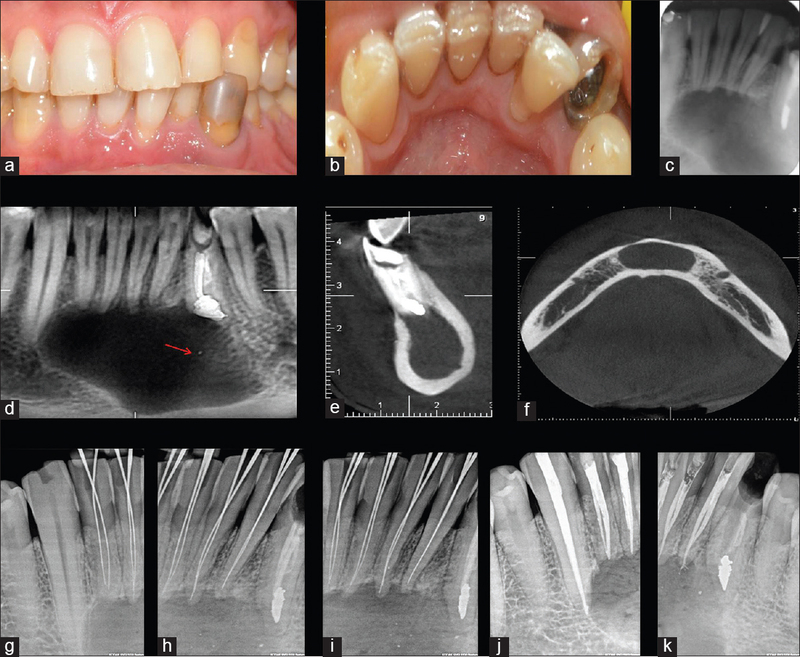 This case report describes the successful endodontic management of a large radicular cyst associated with failed amalgam retrofilling, mucoperiosteal tattoo and amalgam particles dispersed in the epithelial cystic lining. All four mandibular incisors associated with the lesion presented with Weine Type II canal anatomy. The follow-up revealed clinical and radiographic signs of healing. Mishaps can occur during dental procedures, some owing to inattention to detail and others are totally unpredictable. They usually include anaphylaxis or allergic reactions to materials used for restorative purposes or drugs such as local anesthetics. A patient reported to our department with moderate dental fluorosis, and the treatment was planned with indirect composite veneering. During the procedure while cementation acute allergic reaction occurred, the specific cause could not be identified after allergic testing. During the procedure while cementationacute allergic angioedema of upper lip. Anaphylaxis, urticaria, allergy, hereditary atopic eczema, cellulitis, cheilitis granulomatosa, and cheilitis glandularis. The patient was reassured and given prednisolone 10 mg and cetirizine 10 mg orally, once daily for 3 days after which the symptoms subsided. This paper will discuss the pathogenesis, classification, identification, and management of angioedema during dental procedures. The pathogenic relationship between the oral lichenoid reaction (OLR) and dental restorative materials has been confirmed many times. An OLR affecting oral mucosa in direct contact with an amalgam restoration represents a delayed, type IV, cell mediated immune response to mercury or one of the other constituents of the dental amalgam. Bombay blood group patients are more prone to this. 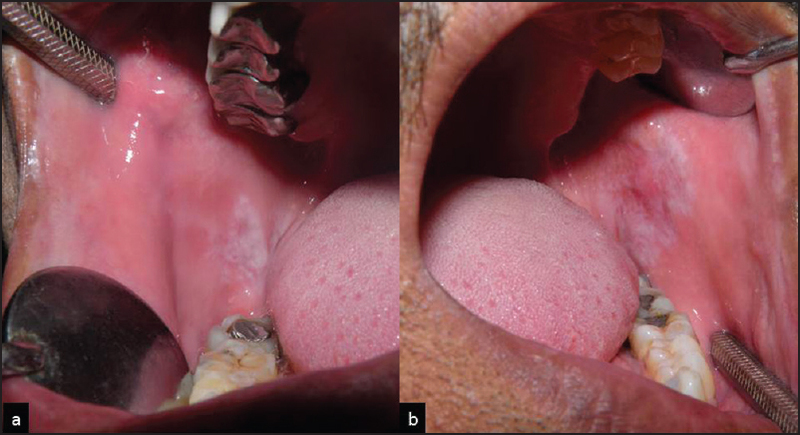 A case of bilateral OLR is presented, which is present in relation to amalgam restoration. The lesion healed up after the replacement of restorations with an intermediate restorative material. The clinician should be aware of all the possible pathological etiologies of white lesions. If there is any doubt about the nature or management of a usual oral lesion, a referral to an appropriate specialist is mandatory. Autotransplantation is the surgical transposition of a tooth from its original site to another, replacing a lost or a compromised tooth by another tooth, usually the third molar in the same individual. This technique is considered a viable method due to its high success rate, well-grounded treatment option, provided the case selection and the procedure followed is within the acceptable limits. 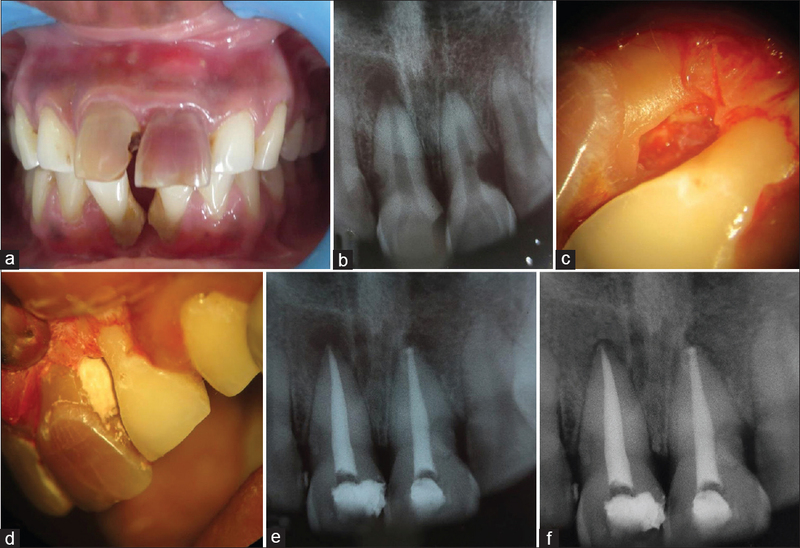 Autotransplantation is considered as an alternative approach of oral rehabilitations in a conservative manner mainly in young patients with compromised financial conditions to perform a high cost treatment. It is a fast way to recover function and aesthetic properties without interfering with the orofacial growth. 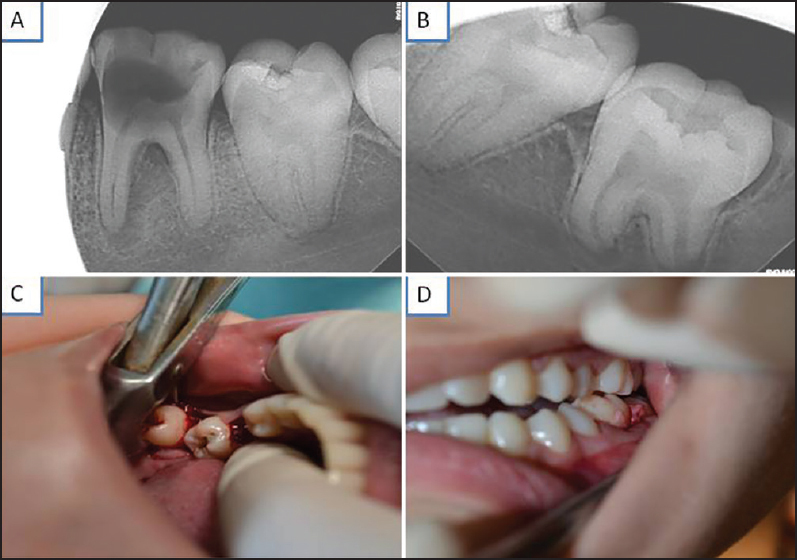 This report describes a successful 4-year follow-up of a case of immediately performed mineral trioxide aggregate (MTA) pulpotomy in autotransplantated mandibular left immature third molar to replace the mandibular left first molar that was extracted due to extensive carious lesion. Invasive cervical resorption (ICR) of a tooth is relatively uncommon and the etiology is not very clear. It is sometimes misdiagnosed and can lead to improper management or tooth loss. Correct diagnosis and proper management can result in a successful outcome. The treatment should aim toward the complete suppression of all resorbing tissues and the reconstruction of resorptive defect by the placement of a suitable filling material or some biological systems. One of the most significant developments of the past decade, i.e. the operating microscope used for surgical endodontics, helps the surgeon to assess pathological changes more precisely and to remove pathological lesions with far greater precision, thus minimizing tissue damage. The aim of this article was to show the management of maxillary left central incisor diagnosed with external ICR using Biodentine under dental operatory microscope (DOM).